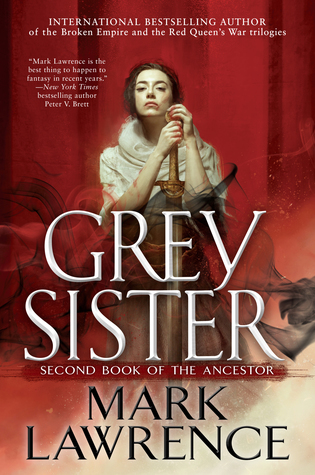 Grey Sister by Mark Lawrence. Ace, 2018. Hardcover. 400 pages. Now this was a thoroughly good book! I reviewed Red Sister last year and very much enjoyed it and felt it had a promising start, but I wasn't totally sure where this series would be going. All I knew was that I definitely wanted to keep reading the series to see where it would go. Grey Sister, I am happy to say, was even better than I anticipated and I am so thrilled to have had a chance to read an ARC of this. After the events of Red Sister, Nona Grey is back at the Convent of Sweet Mercy with the rest of her fellow students as they continue on their education. Of course, it's never as simple as that with any book (and especially when it comes to Mark Lawrence), and unexpected events occur as Nona continues to carry around a few struggles and secrets along with her, and things get a bit dicey. As in Red Sister, there is still a heavy focus on the training and educational aspect of the Convent life, but this time around there is so much more than that to the story that only enhanced what has already been established in this this world. As much as I enjoyed the school and class aspect of the first book, the noticeably smaller amount of classes in Grey Sister was actually quite welcome. There was much more activity and more wide-ranging activities in this book that made this a more fast-paced, engaging read than merely focusing on so much instruction. 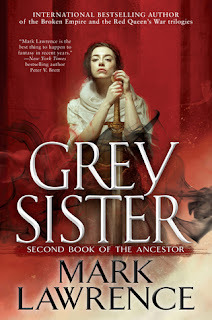 The first book very carefully--and rather slowly--laid the foundation for this world, and now Grey Sister is expanding upon and taking advantage of that groundwork to create an even more in-depth and highly entertaining story. I really found myself so much more involved in this book and completely invested in Nona's story and each event that occured throughout the book. Another area I loved about this book was the characters. There are many returning characters (excluding a few causalities and adding in a few newbies), but because their characters were established so well and thoroughly in the first book, we now get to see much more of them and experience more of their own unique personalities. Because the characters are now more realized and fleshed-out, their personalities shine through and there is so much more humour in this book. Jokes and dry humor abounded--I loved it. There is a lot more that I could say about this book, but to go into any more detail would give away too much about this book and lead to spoilers, so I am going to refrain from doing so. Instead, I will just say that Grey Sister is a truly fantastic sequel to Red Sister, and I highly recommend you pick it up, even if you weren't a huge fan of Red Sister. Overall, I've given Grey Sister four-and-a-half stars! Mark Lawrence knows how to capture his audience and has once again delivered a deeply absorbing and entertaining story.